Watch Trump's remarks in their entirety below. Trump started his speech with naming the hardships the country went through in 2017, from hurricanes to fires to the Las Vegas shooting and talked about the need of unity. "I call upon all of us to set aside our differences, to seek out common ground and to summon the unity we need to deliver for the people," he said. He then went on touting the economic successes due to tax cuts. He said that since the 2016 election, "2.4 million new jobs, including 200,000 new jobs in manufacturing alone" have been created and unemployment claims have hit a 45-year low. "After years and years of wage stagnation, we are finally seeing rising wages," he said. "The great news for Americans, 401K, retirement pension, and college saving accounts have gone through the roof," he said. "And just as I promised the American people from this podium 11 months ago, we have enacted the biggest tax cuts and reforms in American history." Trump called on Congress to produce a bill generating $1.5 trillion for the new infrastructure investment our country so desperately needs, leveraging every dollar for private partnerships to overcome the infrastructure deficit. “Together we can reclaim our great building heritage,” he said. He also called for investing in workforce development and job training. “And let’s support working families by supporting paid family leave,” he said. Among the top priorities for the next year Trump promises to bring down the prices of drugs, attacking Big Pharma. “And prices will come down, substantially. Watch,” he said. Trump also addressed immigration reform disagreements, which caused the recent government shutdown. He called on Congress to finally close the deadly loopholes that allowed gangs like MS-13 to break into our country. Trump said that around the world the US faces terrorists and rivals like Russia and China, countries which he only mentioned once by name, that challenge our economy and values. “We must modernize and rebuild our nuclear arsenal, hopefully never having to use it," he said. Besides criticizing bureaucrats, he made an attack on protests during NFL games when people didn't stand for the national anthem. 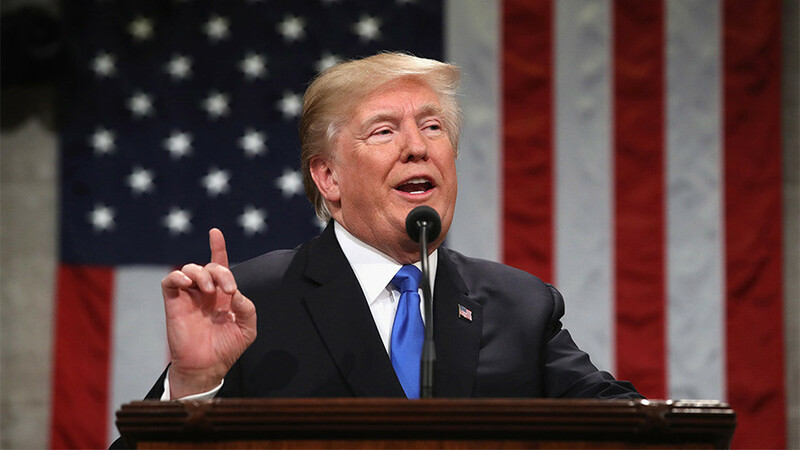 Each year, the president of the United States delivers a speech to the American people outlining the administration’s legislative agenda for the coming year. Since almost all most high-ranking officials attend the event each year, one member of the president’s Cabinet is selected to stay at a secure undisclosed location outside Washington DC should they be killed in an attack. This year, Agriculture Secretary Sonny Perdue will serve as the “designated survivor.” The agriculture secretary position is the ninth in the line of succession. This year, the policy portion of Trump’s speech was written by Vice President Mike Pence, National Security Advisor H.R. McMaster, and National Economic Council Director Gary Cohn, while the text of the speech was crafted by staff secretary Rob Porter, policy advisor Stephen Miller, and speechwriters Vince Haley and Ross Worthington, according to NBC News. “There has never been a better time to start living the American dream,” Trump said. It outlines how Trump will praise his administration for eliminating regulations, ending the “war on clean coal,” new trade deals, and military victories against the Islamic State. However, many have pointed out that Trump’s line declaring a “new American moment” was previously used by former Secretary of State Hillary Clinton in a 2010 speech to the Council on Foreign Relations.